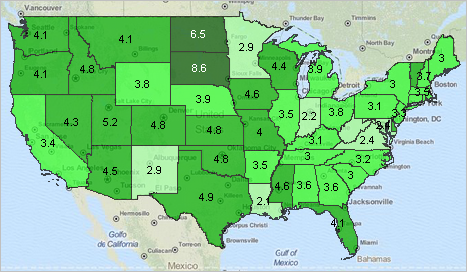 Updated quarterly, this section provides an interactive table to view, rank, compare personal income by state based on estimates developed by the Bureau of Economic Analysis. Use the associated GIS project to visually analyze personal income patterns; integrate your own data. See What's ahead calendar for schedule. See more about personal income. Click graphic for larger view with legend. View developed using CV XE GIS with associated GIS project (available for download by ProximityOne User Group members (join now, no fee). Columns shown total personal income (billions$, seasonally adjusted) for each quarter 2012Q1 through 2013Q3 followed by quarter to quarter percent change columns and percent change 2012Q3 - 2013Q3. Personal income is the income received by all persons from all sources; the sum of net earnings by place of residence, property income, and personal current transfer receipts. Property income is rental income of persons, personal dividend income, and personal interest income. Net earnings is earnings by place of work (the sum of wages and salaries, supplements to wages and salaries, and proprietors’ income) less contributions for government social insurance, plus an adjustment to convert earnings by place of work to a place-of-residence basis. Personal income is measured before the deduction of personal income taxes and other personal taxes and is reported in current dollars (no adjustment is made for price changes).